Since completing her term as Riggsby Director of the Marco Institute, Heather Hirschfeld, professor in the English department has been extraordinarily busy, and the College of Arts and Sciences took notice. In the 2018 College Convocation, she was recognized for outstanding Research Creative Achievement at the senior level. Most recently, Hirschfeld has published two major volumes—The Oxford Handbook of Shakespearean Comedy and the New Cambridge Shakespeare edition of Hamlet. For the former book, she drew together and edited 33 separate essays. For the latter, she wrote a 35,000-word introduction, copious notes, and histories of performance and response to the play. 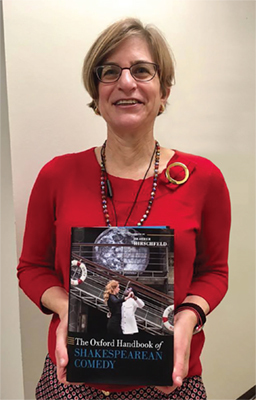 “The fact that she was able to complete these two volumes simultaneously is a testament to her tremendous productivity,” said Allen Dunn, head of the English department. Next on the docket for Professor Hirschfeld is a new monograph titled The Resources of Hell, a study of the concept of Hell in early modern literature and culture. Marco congratulates Hirschfeld on this well-deserved recognition!